Stevia is a natural non-caloric sweetener that has been used for centuries by South Americans, and more recently by the Japanese. It is also known as stevioside and steviol glycoside. It is suitable for use by diabetics and by those on low carbohydrate/calorie diets. Where Does Stevia Come From? Stevia is extracted from the Stevia rebaudina plant, also known as "sweet leaf" or "sugar leaf". The plant can be found in the tropical and subtropical regions of the world. 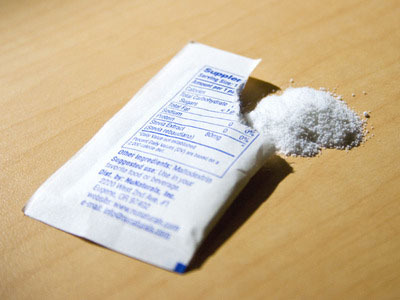 Low calorie sweeteners often have applications for weight and fat loss. Stevia is no exception. A study has shown that when using stevia, subjects felt the same level of satiety (fullness from food) when compared to regular sugar. Furthermore, stevia did not illicit much of an insulin response (Anton et al, 2010). What this means is that the overall energy intake sugar throughout the day can be reduced as a result of using stevia in place of sugar. This is beneficial for those wishing to lose weight or fat. Although research in this area is in its infancy, there is some evidence to suggest that supplementation with stevia may increase glucose tolerance and decrease glucose levels. Consequently, stevia may one day be useful in the treatment and management of type 2 diabetes (Goyal et al, 2010). One potential downside to the use of stevia is that some extracts have a bitter after taste. People have different explanations about this, but it's usually attributed to other naturally occurring compounds in the stevia plant (Goyal et al, 2010). Just like other sweeteners, some people have concerns over the safety of stevia use. There have been some studies that show that in some cases, stevia may have mutagenic properties. However, these studies have been dismissed some countries and stevia is regarded as being safe in many countries (Goyal et al, 2010). Japan is the largest user of stevia, and have used it for decades it in place of artificial sweeteners such as aspartame. No adverse effects, as a result of long term stevia use, have been reported. Stevia is approved for use in Australia, but not in the USA unless it is considered a dietary supplement. Use stevia in place of sugar as recommended by the manufacturers. There is no specific timing that needs to be followed. To provide an example of the worlds growing international appetite for Stevia, we have it on good authority that none other than Coca Cola have recently invested heavily in the research & procurement of Stevia. Which is thought to be a part of Cokes futuristic plan to offer a natural green healthy sweetner in the Coke product. Coke Life i.e Green Coke Stevia has been launched in Argentina, it is believed by some to be a trial pilot market before the likely international launch of the product including Australia. Stevia can be found in two forms. It is either a leaf powder, which is eight times sweeter than sugar, or an extract which is 300 times sweeter than sugar. Obviously, the amount to be used depends on the form that it is in. Other than the other names of stevia already mentioned, also look out for the term “Rebaudioside A”. Stevia is used as a sweetener in some bodybuilding supplements such as milk protein powders, weight gainers, natural protein powders, and antioxidant supplements. In this writer’s opinion, the popularity of stevia may increase in the next few years, and its use will become more widespread. Stevia can be stacked with anything.